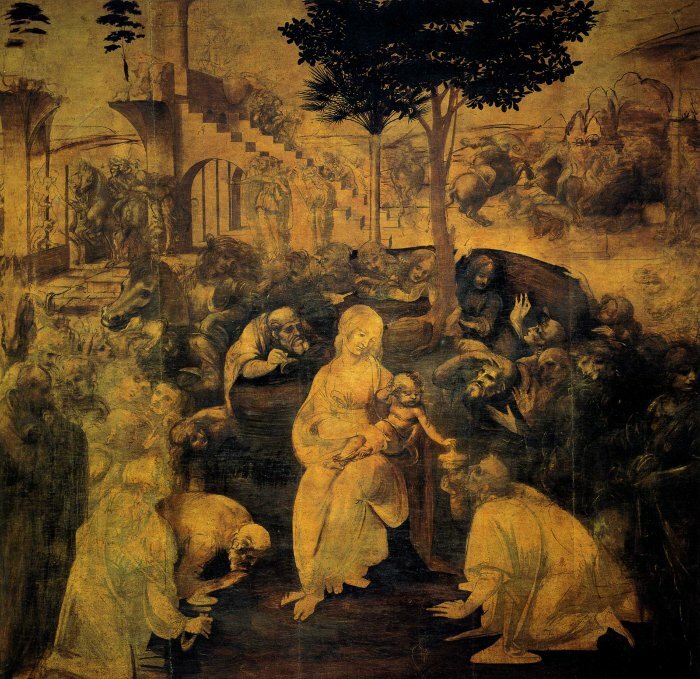 In 1481 Leonardo was commissioned to paint an altarpiece for the Monks of San Doneto a Scopeto in Florence. The theme was the "Adoration of the Magi", and the contract required delivery of the painting within 24 months with an extension for a further 6 months if required. 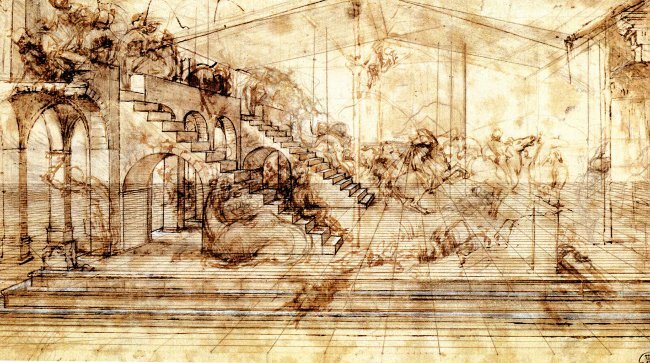 Unfortunately, because Leonardo had left Florence for Milan, the work was left unfinished. 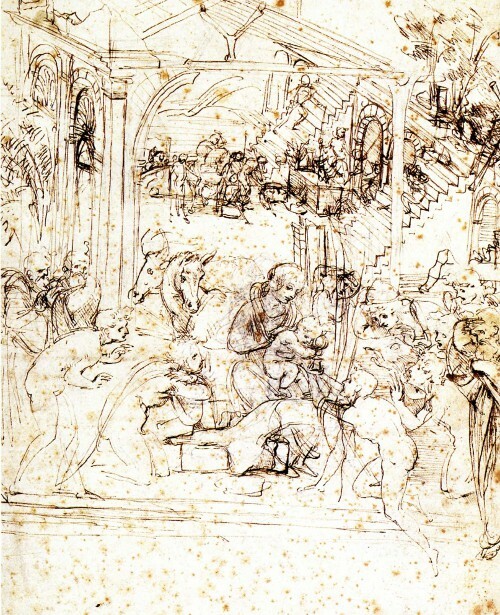 Leonardo’s Adoration features the central figures of Mary with the infant Jesus on her lap. They are surrounded by an array of characters who have all come to pay homage to the baby Jesus. Despite the sketchiness of the work, the placement of the figures conveys a great sense of movement within the picture. Kneeling before Jesus, and being blessed by his outstretched hand, one of the three Magi (Balthazar) offers his gift of frankincense. 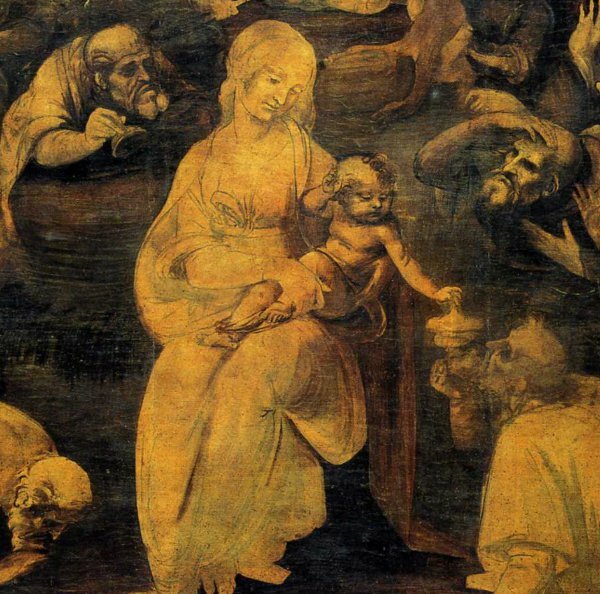 The two figures in the left foreground are the kings Caspar, who bows so low that he almost touches the ground, and Melchior who kneels with his head raised his gaze fixed on the Virgin and Child. 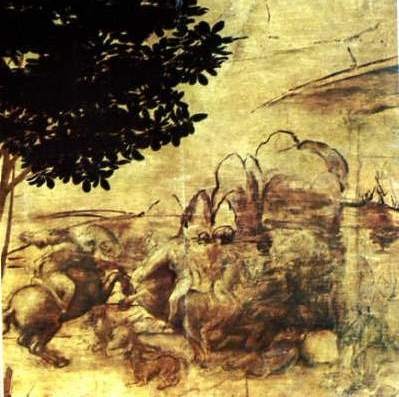 The background of the work is dominated by an architectural structure on the left and a battle with riders on horseback on the right. The building is thought to be the ruins of the palace of King David while the battle scene is a reference to a time when the three kings were mortal enemies. Of course, the Magi made peace with one another on their long journey as they followed the Star of Bethlehem from their kingdoms in the East. oil on wood panel, 246x243 cm. now in the Uffizi, Florence. Leonardo da Vinci. Leonardo made many sketches in preparation for this altarpiece, they offer some insight into the great amount of thought that da Vinci lavished on this work. What a pity that his vision was not rewarded with a completed painting. The monks eventually commissioned their altarpiece from Fillippino Lippi, and the painting (of the same subject) was delivered in 1496. Sketches in preparation for the main work.